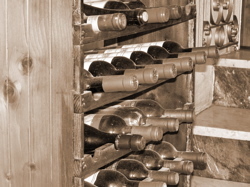 Correct wine storage is critical to the appreciation of fine wine. Have you ever had a bottle of wine that should have been great, yet somehow it failed to live up to expectations? Well that happens, and there are a lot of reasons it can happen. Maybe it was too young and closed up, maybe it just wasn't a good wine to begin with. But one of the preventable problems is a poorly stored wine! Once a wine has been stored poorly and gets damaged, it is irreversible, so don't let it happen in the first place. Good wine is a living, breathing thing. It is in a constant state of flux, even in the bottle. And just like other living things, it is susceptible to changes in its environment. Just like your body likes to be at a constant 98.7° F, your wine likes a constant temperature, humidity, and other environmental factors. That is why wine cellars all look similar, cool and damp. If you aren't blessed with an underground wine cellar in your house, then buying a wine cellar can be one of the most important investments to protect your investments. And when we say investments we don't mean that you are going to sell your wine, I'm talking about an investment in your wine drinking future, and thus your future happiness! What is the Ideal Wine Storage Environment? - Probably the single most important factor in storing wine is temperature. Wines like a cool temperature but also prefer a stable temperature. Wide swings in temperature can move the cork in the bottle and lead to damage. Most people agree that the ideal temperature is about 55° F. Again, try to keep it as constant as possible. If you can only get it down to 60°, thats probably ok, but again, as long as the temp is relatively constant throughout the day and year then you should be ok. Keep in mind though that warmer wine cellar temperatures lead to faster aging and development of a wine. Cooler temperatures slow down the process and wines will last longer, but age slower. - There is more disagreement whether humidity plays quite as big a role in ideal wine storage. Traditional wine cellars, built into the rock underground, are cool and damp, often moldy even. This high humidity helps keep corks moist and hydrated so that they don't dry out and allow air to pass around them. However, assuming you are storing your bottles so that the wine is in contact with the cork, this helps to prevent drying as well. Ideally, cellar humidity should be about 70%. If it gets too high, over about 80% you can start to have problems with the labels on your bottles. They will get damp, moldy and even fall off. - Most cellars store wine bottles laying on their sides, with a few exceptions. The reason for this is to keep the wine in contact with the cork in the neck of the bottle. If bottles are stored upright, the cork has a tendency to dry out, particularly if you have a cellar with low humidity, and we have even seen corks get so dried out like this that they fell down into the wine of their own accord! Some people like to store wine in boxes and ask if storing them upside down (cork down) is ok. This is generally fine as well; however, if wines drop a significant sediment as they age, in this position the sediment will collect completely in the neck of the bottle and along the cork. When you go to pour the wine you may have a hard time avoiding the sediment unless you either stand the bottle upright for a few days prior to service or filter the wine when serving. - Wine doesn't like light. That is why most wine bottles are made of a dark brown or green color. Regardless, wine storage should not be in a place that is brightly lit. Occasional soft light to admire your collection or find a bottle is not a problem, but long hours of light on bottles over months or years can definitely lead to problems. This factor is also hard to prove and some people would argue it doesn't play as much a role in wine storage. However, wine probably does react to excessive vibration and movement so try to keep your wines, particularly for long term storage somewhere that is stable. In the short term, if you are going to be serving an older wine in the near future, avoid movement as much as possible and keep the bottle in the same position. Any movement can stir up sediment in the wine and made service more difficult. When buying wine to consume soon, in the short term (days to weeks) wine will not suffer from most wine storage conditions. However, even in a very short time, extreme fluctuations in temperature or very high temperatures can significantly injury a wine. For example, many people make the mistake of putting a few bottles of new wine into their car trunk, or even inside the car, on a warm day. As you know, the temperature in your car can skyrocket very quickly. You may think you are only going to leave them there a few minutes, but if wine gets up above 80° F or so it starts to deteriorate very rapidly, losing its freshness, complexity and subtle aromas and flavors. Eventually it will get a cooked, or Madeirized, aroma and flavor. Don't be fooled, this can happen quickly at these temperatures! Additionally, wide temperature fluctuations can push the cork up out of the bottle. Even if it doesn't come out completely, a bulging cork can be a sign that irreversible damage has already been done. If you have a wine cellar, then even in the short term you should throw your new bottles in there, even if you intend to serve them soon. If you don't have a wine cellar, find a cool, dark place in your house, a basement or maybe a cool closet and set your bottles in there until time to serve. If all else fails, you can store a bottle or two in your refrigerator, but this is too cold and too low humidity for long term storage. If they are white wines, they will only need to come up in temperature a bit before service. If they are red wines, you will want to take them out and set them on the counter for quite a while before serving. For more information about correct wine service temperatures, see our Wine Temperature page. Passive wine cellars are those that require no active temperature control, they self regulate temperature and humidity and stay constant. These are rare in the New World. To have a good passive cellar you need a spot that is cool and constant year round, which usually means deep underground or dug into rock. In Europe, many old castles, wineries and homes have these already built in. If you are lucky enough to have one, this is a great place to store your wine in the short and long term for aging. If you have a basement and want to determine the temperature and humidity, I recommend you buy a digital thermometer and hygrometer. They are often built into the same device and they save the highest and lowest readings since the last reset. This allows you to leave it in your wine cellar and see how much the temperature fluctuates between day and night and even from season to season throughout the year. Active wine cellars are more common. They are the ones that have a thermostat and an air conditioning device to keep the temperature cool and as constant as possible. These can be anything from an insulated and temperature controlled basement, room, or closet. You can also buy free-standing wine cellars, which look like a fancy refrigerator, that serve the same purpose. They come in many sizes from small 20 to 50 bottle sizes to large walk-in closets. These are an excellent solution for those of us not lucky enough to have a real wine cellar dug into the side of a mountain. Check around because they vary widely in size, price, features and appearance. If you do get one, I recommend checking the temperature and humidity with a digital gauge so that you can be sure it is keeping the temperature you think it is and that it is relatively constant. If you don't have either of the above (or if you run out of space at home!) take a look in your yellow pages for local wine storage facilities. Most major cities have facilities that rent out wine storage lockers varying from a few cases in size to huge walk in closets that can store hundreds of cases. They are basically like a temperature controlled self storage unit. Again, shop around because you ideally want one that is not too far so that it is convenient to your house and affordable. While it can be a pain to have to drive somewhere to get to your wine cellar, the peace of mind you get from knowing your wine is safely stored is worth it! If none of these ideas is suitable for you, you can store wine longer term in a cool closet or even the refrigerator. Both of these are not ideal. Most closets are not cool enough and the temperature may fluctuate quite a bit from day to night and from season to season. While this may not matter for short term storage, it can be a big problem in the long term. Also, refrigerators are not ideal for long term storage because they are too cold, their temperature also fluctuates somewhat (with each time you open the door!) and they generally have very low humidity that dries corks out. Good luck finding good wine storage for your special bottles. But remember, a wine doesn't have to be expensive to be special, so be sure to store all your wine in good conditions so that any wine you serve shows the best it possibly can! Done learning about Wine Storage?